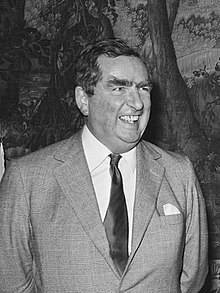 Denis Winston Healey, Baron Healey CH, MBE, PC (30 August 1917 – 3 October 2015) was a British Labour politician. He was Secretary of State for Defence from 1964 to 1970 and Chancellor of the Exchequer from 1974 to 1979. Healey was born in Mottingham, Kent, and moved with his family to Keighley in the West Riding of Yorkshire when he was five years old. He was given the middle name "Winston" after Winston Churchill, who was an important politician at the time Denis was born. Healey was one of three children. Their father was an engineer who had worked his way up by taking extra lessons at night school. Healey went to Bradford Grammar School, and in 1936 he won a type of scholarship known as an "exhibition", which gave him enough money to take a degree at Balliol College, Oxford. At Oxford University he got involved in politics, and he joined the Communist Party of Great Britain in 1937. In 1939, not liking the party's policies, he changed his mind. From that time on, he supported the Labour Party, even though one of his best friends at university, Edward Heath, supported the Conservative Party. After getting his degree, Healey joined the Royal Engineers, and served in the British forces in several countries during World War II. He took an important part in the Battle of Anzio, towards the end of the war. After the war, he joined the Labour Party, and made an important speech to the Labour Party conference in 1945, shortly before the United Kingdom general election, 1945. In February 1952, Healey became the Member of Parliament for Leeds South East. He supported Hugh Gaitskell, the leader of the Labour Party. When Gaitskell died in 1963, Healey became a supporter of Harold Wilson. When Labour won the 1964 election Healey was given the job of Secretary of State for Defence. Labour lost power in 1970, but Healey was given the job of Shadow Chancellor in April 1972. When Labour won a general election in March 1974 and came back into power, Healey became Chancellor of the Exchequer in March 1974. When Harold Wilson resigned as Prime Minister in 1976, Healey was one of those who hoped to take over, but he was not chosen. He continued in the job of Chancellor of the Exchequer when James Callaghan took over as Prime Minister. Healy married Edna Edmunds in 1945. Together, they had three children. They lived in Alfriston, Sussex. Edna died in 2010. On 14 June 1978, Healey likened being attacked by the mild-mannered Geoffrey Howe in the House of Commons to being "savaged by a dead sheep". Nevertheless, Howe appeared and paid warm tribute when Healey was featured on This Is Your Life in 1989. The two remained friends for many years, with Howe dying only a few days after Healey, in 2015. Healy died at his home in Alfriston, Sussex on 3 October 2015 from a short-illness, aged 98..
↑ Kaufman, Gerald (13 March 2000). "Debates for 13 Mar 2000 (pt 20)". Hansard (London: House of Commons). https://publications.parliament.uk/pa/cm199900/cmhansrd/vo000313/debtext/00313-20.htm. Retrieved 31 January 2009. ↑ "ECONOMIC SITUATION, HC Deb 14 June 1978 vol 951 cc1013-142". millbanksystems.com. ↑ "Labour's Denis Healey dies at 98". BBC News.com. Retrieved 3 October 2015. "Desert Island Discs". Desert Island Discs. BBC News. Radio 4. 14 June 2009.